Cape Town - Jacques Kallis became just the fourth player to pass 13 000 Test runs on Wednesday, putting the quietly spoken South African within sight of one more significant achievement in a prodigious career where he has a claim at being his country's greatest cricketer and the world's best ever all-rounder. The 37-year-old Kallis can this year overtake Rahul Dravid (13 288 runs) and Ricky Ponting (13 378), who are retired, to become the second highest run-scorer in test history behind the incomparable Sachin Tendulkar. Tendulkar's mark of 15 645, which "the Little Master" can still add to, is likely out of reach. But although Kallis has consistently refrained from talking about retirement in recent years, finishing his career at No 2 on the Test batting list having also taken nearly 300 Test wickets as a fast-medium bowler will be viewed as a landmark for cricket's all-rounders for years to come. Kallis joined Indian pair Tendulkar and Dravid and former Australia captain Ponting past 13 000 with a push down to third man for four off Doug Bracewell on the first day of the first Test against New Zealand at Newlands. He reached the milestone at his treasured home ground at Newlands and within a stone's throw of where he went to school at Wynberg. Kallis passed the career milestone in his 159th Test and on a record-filled day in Cape Town and - like during many of his 44 career centuries - he made little fuss over it and gave away little emotion. Recognised as a once-in-a-generation player in his home county, he quickly recognised the applause from his home city's fans and returned to the job of adding to South Africa's already significant first-innings lead. Soon after, he registered his 57th Test 50 in typically calm fashion and eventually fell for 60 to take his career total to 13 040 Test runs. His 44 Test hundreds are also second only to Tendulkar's 51. Proteas fast bowler Dale Steyn had earlier become the joint third fastest bowler to 300 wickets with the first of his two wickets in the morning, helping send New Zealand to 45 all out, their third lowest score ever, the equal 12th lowest in Test history and the lowest at Newlands in over 100 years. Steyn reached 300 wickets in his 61st Test, the joint third-fastest player to 300 and behind only Australia's feared fast bowler Dennis Lillee (56 matches) and Sri Lanka spinner Muttiah Muralitharan (58). But while Steyn's legacy and career is still to be fully realised, the introverted Kallis has underlined his rare and lasting value over and over in an 18-year career, combining world-class batting talent with the ability to also remove the world's best batsmen with his seam bowling. 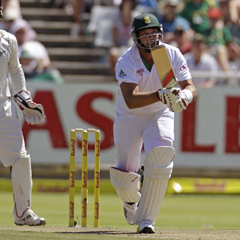 Away from his batting, those uncomfortably fast right-arm seamers have brought Kallis 282 Test wickets, putting him fifth overall on South Africa's list of test wicket-takers and - incredibly - leaving him not far off joining Steyn, Allan Donald, Shaun Pollock and Makhaya Ntini as the only South Africans to reach 300 career wickets. As a batsman or a bowler alone, his statistics are impressive. Together, they quietly tell the story of a remarkable cricketer that South Africa will miss mightily when he retires.